National Tarbiyat Annual Meeting Registration Form. Since the registration date is past due, please email ayaz.ul.haque@ahmadiyya.us after you register to confirm. The detailed agenda is available here. But please aim to be at Bait-ur-Rehman by 9am Saturday, March 18th until after Zuhr prayers on Sunday March 19th, 2017. Please complete your registration above indicating your accommodation requests. More details on accommodation will be provided shortly. Air-fare will be fully reimbursed: Exceptions will be considered on a case by case basis. If you are traveling by air, the suggested arrival/departure airport is BWI. Airport-pick-up/drop will be provided from/to BWI. Please refer to the detailed Reimbursement Policy here. To receive reimbursement for your travel and other approved expenses, please complete the Check Request Form and email it along with your receipts to fakhar.ahmad352@gmail.com. Dear Respected Tarbiyat Secretary or Tahir Academy Principal: Assalamu Alaikum wa Rehmatullah. Please register here – before January 15th 2017 – for the annual in-person Tarbiyat and Tahir Academy Principal’s meeting with respected Ameer Sahib USA. The meeting is scheduled for March 18th and 19th, 2017 at Bait-ur-Rehman, Silver Spring, MD. A detailed agenda will be sent to you shortly, but please aim to be at Bait-ur-Rehman by 9 am Saturday, March 18th until after Zuhr prayers on Sunday March 19th, 2017. Those Presidents who do not carry out their duties despite repeated reminders, their reports should be sent to me. This should be also done for the secretaries of finance, tarbiyat and tabligh—if not twice a year then at least once a year such a meeting must take place and a pulse should be taken of their pace of work. If these secretaries become effective and active then the concerns and issues faced by the other departments would get resolved automatically on their own. 1. Block March 18th and the 19th on your calendar and make travel arrangements. Transportation will be provided from BWI airport. Air-fare will be fully reimbursed subject to the reimbursement guidelines. Exceptions will be considered on a case by case basis. 2. 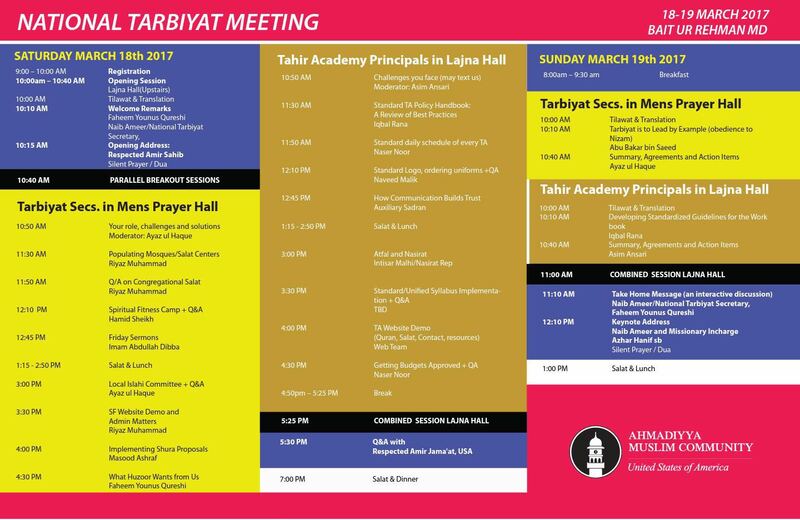 Please confirm your attendance to the meeting by completing the National Tarbiyat Annual Meeting Registration Form. Questions? Need more information? Please reach out to the following lead organizers.